Former deputy mayor of London Ian Clement has been given a suspended 12-week jail sentence for fraudulently claiming the cost of restaurant meals. 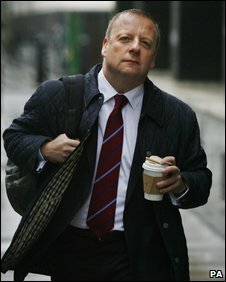 He admitted making three unauthorised expense claims, totalling £156, while working at City Hall in November 2008. Two further counts of fraud against Clement, 44, were discharged at Westminster Magistrates' Court. The judge also ordered Mayor Boris Johnson's former aide, from Crayford, to do 100 hours of community work. After pleading guilty to the charges, Clement said: "I have failed to live up to the high standards of office that were properly expected of me." Clement stepped down as deputy mayor for external relations in June. He served as leader of Bexley Council from May 2006 until May 2008. District Judge Quentin Purdy said Clement had "flagrantly and arrogantly" abused public money. "You must have known full well when questioned in relation to these matters of the manifest bogusness of the claims you were making. "That said, I accept you have lost much as a direct result of your wrongdoing. "You knew very well what was required when using a corporate credit card and you saw yourself as somehow above the rules." The court heard Clement paid for unauthorised restaurant meals on his card. Personal use of a corporate credit card is a breach of City Hall regulations. Clement said: "I have given many years of dedicated public service to London, which has been my pride, my passion and my life. That is now over. "There is no denial in regards to my responsibility. "I very much regret and indeed am truly sorry for my actions and that these have let down many good people, my family, my friends and colleagues including and, not least, the mayor of London." Judge Purdy suspended Clement's jail sentence for 18 months and imposed a curfew of between 9pm and 6am for 12 weeks. Clements was also ordered to pay £1,000 in prosecution costs. In mitigation, Clement's barrister Jim Sturman QC said: "He is a 44-year-old man who has made some extremely stupid choices for which he blames himself and takes responsibility." He added that his client was struggling to pay his mortgage, had little money and could not find work.